2. John Dopson, 1991 Topps. My brother and I would mock this guy every time he came in a package. You’d find 1 awesome Clemens card where he’s posing by the wall for ever 34 John Dopsons. He looked more like a guy who would work the fish counter at stop & shop than a major league pitcher. To this day, I think I’ve got about 15 John Dopsons in my parents basement. 3. Rowland Office looks like the adult version of one of The Cosby Kids. 4. The Bad News Bears one may have been me. I remember needing to know which Astros were chanting “Let them play” at the Astrodome. 5. 1 : Very amusing. There’s always something to make me laugh in these comments. On that note, there are some recent interesting comments on some older posts, illustrating another thing I enjoy with this site–conversations relating directly or indirectly to guys such as Herb Washington of the A’s, Bill Buckner of the Red Sox, and Bruce Sutter of the Cubs (the three old posts to attract the latest comments) remain open in perpetuity. 7. 6 : Thanks again, Jeff. Stay tuned: the next entry will be mentioning (in passing) the We Are Family Pirates. Great stuff…..since discovering you, I am now addicted….looking forward to getting your book. On the subject of Rowland Office, I too, was always fascinated with odd-sounding names. 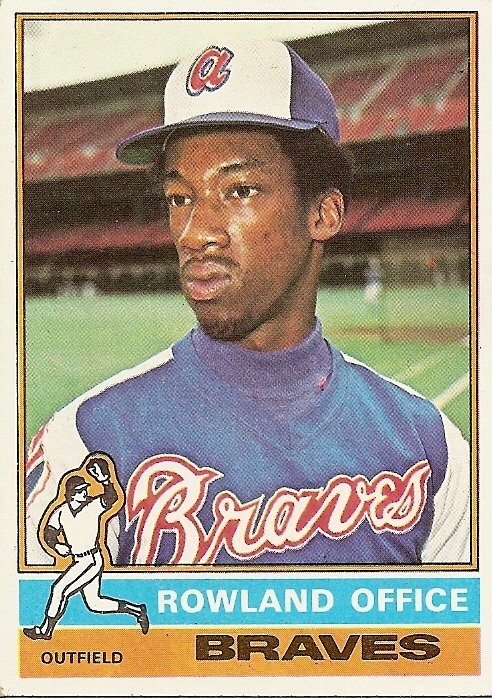 Along with Mr. Office, one of my other favorite unique names was Hosken Powell, the outfielder for the Twins. Hosken??? Is that Dutch?